I’ve been eager to write this post since I started this blog; but It’s been over a year now, so what gives? I think I’m scared I won’t do the topic justice; that I won’t be able to convey to you in pictures, words, or recipes how important this subject is to me. Ideas about how to start writing and what to write about have been floating around in my head the whole time, but never come to fruition. At this rate, I’ll never feel ready. So this morning — fueled with a cup of coffee, some soft boiled eggs, and a sliced bartlett pear — I’m pulling off the bandaid. This morning at least I finally have a recipe, if nothing else, worthy of this post. Now don’t get me wrong, I don’t condone raiding the cookie jar or pulling out the ice cream first thing in the morning; and I won’t be slicing off a piece of layer cake or lemon meringue pie. But what about a couple nut-studded biscotti; a slice of cinnamon-laced, struesel-topped coffee cake; or a piece of leftover pumpkin or apple pie to go with that coffee? You get the picture. The lines get blurry fast. Whether staying in, or going out; I get more excited about breakfast than any other meal of the day. Many Saturday mornings, I force myself to stay in bed until 7 even though I’ve been running through the ingredients in my pantry for the last half hour deliberating on scones or waffles or mini bundt cakes… Ask me where I’d like to go for dinner, and (often to Mr. R’s frustration) I have few solid opinions; but ask me where I want to go to breakfast, and I have too many favorites to choose from. I’ve left a trail of favorite breakfast spots in all the cities I’ve lived: Bradburys, Crema, Marigold Kitchen, Lazy Jane’s, Sophias, and Batch Bakeshop in Madison; Floriole, Tweet, M. Henry, Medici, and Doughnut Vault in Chicago; Lucia’s, Patisserie 46, Key’s Cafe, and the Salty Tart in Minneapolis/St. Paul. 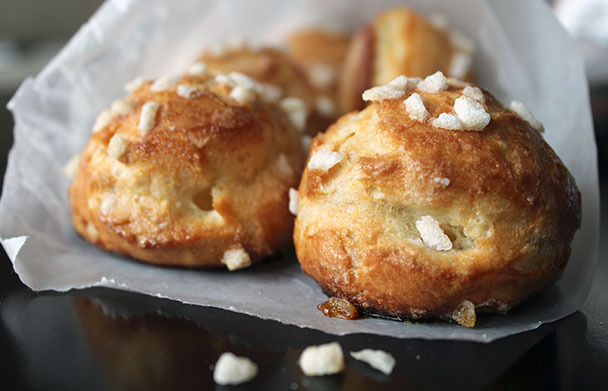 When we were visiting Paris last year, amid all the chocolate croissants, Kouglof, and Chausson aux Pommes, Mr. R and I accidentally happened upon a new breakfast treat — the Choquette. Although not unfamiliar in its basic components; the concept was entirely novel, yet simply brilliant to me. Two-bite puffs of Pate a Choux dough (you’re familiar with it as the airy dough used for eclairs and cream puffs) studded with large, crunchy pearls of sugar, and sold by the bagful at the register; they were the tantalizing French equivalent of candy bars at the check-out lane, but so so much better! I’ve been meaning to make them at home ever since we came back, but much like this post never got around to actually doing it. So this past Saturday, I got out of bed with one purpose and was perfectly rewarded. 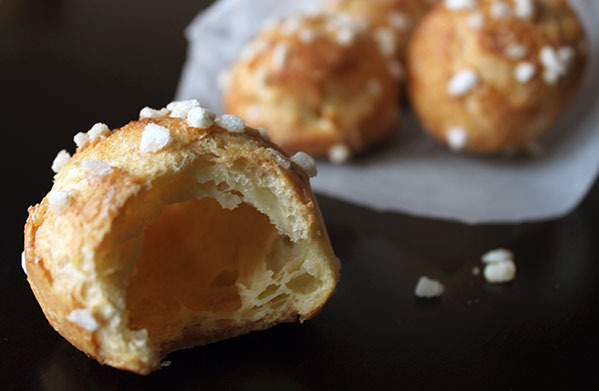 Golden and crispy on the outside, with a bit of crunch and a hint of sweetness from the sugar yielding to a tender, eggy center not unlike a popover; these Choquettes were more addicting still warm from the oven than any of the ones we purchased in Paris. So if you’re getting ready to settle in for a lazy weekend morning on the couch with the paper or intent to catch up on your latest DVR recordings, I recommend these as the perfect accompaniment. I hope you find these as worthy of my first (of certainly many future) breakfast posts as I do; just be warned, you will find them gone much too quickly! Simple in ingredients and effort, the most demanding bit of this recipe is the baking time. For those of you more inclined to savory breakfasts, these choquettes are really not that sweet; and I encourage you to make them as a perfect side to your scrambled eggs and bacon. These are best eaten still warm from the oven, but any leftovers will serve as tantalizing little bites throughout the day. The recipe makes enough for two, but will double fine to accommodate more people or more DVR. Combine 1/2 Cup water and 1/2 Cup sugar in a small pot and heat until the sugar dissolves. Stir in the optional orange marmalade and orange flower water, bring to a boil, then remove from the heat and set aside. This is your simple syrup. Instead of marmalade, feel free to flavor it with things like lime zest, vanilla, etc. Preheat your oven to 400° and line a baking sheet with parchment or a silpat. Fit your kitchenaid with a bowl and the paddle attachment. 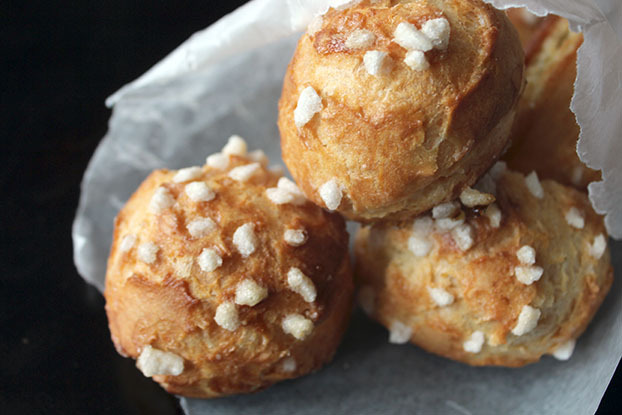 Make the Pate a Choux. Add the butter, water, sugar, and salt to a medium pot and heat on medium just until the butter is melted but do not let the mixture boil. Dump in all the flour and stir everything together with a wooden spoon. Continue stirring for ~5 minutes. The dough will form into a ball and steam and sizzle as the water evaporates. Just as the dough starts to take on a bit of color, turn off the heat. 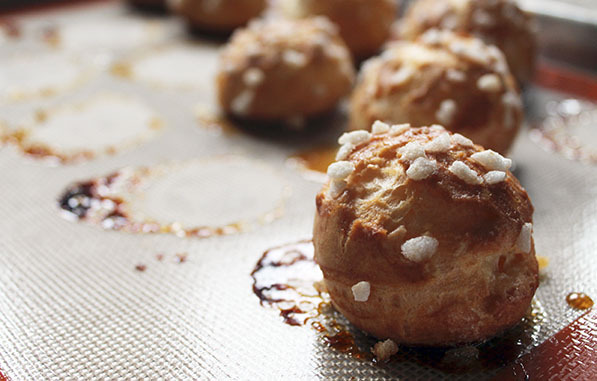 Using a piping bag or two spoons, make golf ball sized mounds of dough on your prepared baking sheet. Leave enough space in between for the dough to expand, about 2 inches. Brush the dough liberally with the simple syrup then cover them in pearl sugar. The more liberal you are with the sugar now, the better. Once the dough puffs up, the sugar will spread apart and what looked like an obscene amount before will look sadly sparse now. So smush as much sugar as you can on those buggers, and don’t be afraid to get your fingers sticky doing it. Pop your tray into the oven and bake for 15 minutes. Reduce the heat to 325° and bake for 30-35 minutes more until the choquettes are evenly golden brown. Remove from the oven, pop them into a big bowl, grab a mug of coffee, and settle yourself down on that couch! 4 Responses to "A Lazy Weekend Breakfast"
These are definitely worth trying. This Saturday looks like a good time! I think you are missing eggs from your ingredient list. Oops! Thanks for spotting that!